Term life insurance is pure insurance protection that pays a predetermined sum in case of unfortunate death of the insured during a specified period of time. Putting in simple words – Term insurance is the most basic and useful form of life insurance. It provides a large cover at low premiums making sure that the nominee of the policyholder can live the same lifestyle in case of the policyholder’s death. Remember that “There is no other financial product as essential as a term insurance plan”. Life’s uncertainties – Consider a situation where there is only one breadwinner and his family requires Rs. 1 Cr. to live the same lifestyle in case he is not around. Arranging this Rs. 1 Cr. rupees may be the difficult task for the most individuals. Death is uncertain and no one can be sure that they can build a good amount of money, which will be sufficient to take care of their family, before their death. But this enormous task can be completed, if there is a combined effort. Let’s say if 1000 individuals come together and contribute Rs.10,000 each, there is a corpus of Rs. 1 Cr. in place in quick time. This group of individuals can create a safety shield for that one unfortunate person who dies before saving for his family. This arrangement is known as term insurance. Term plan is the simplest form of life insurance. It is a very cost effective way to buy financial & life protection. In simple words, one pay’s premiums and in return the life insurance company provides a financial benefit to the nominee in case of his death. Why should you buy Term Life Insurance Plan? Low Premium – The premium for a term plan is relatively lower than all other insurance plans because there is no investment element in the amount insured. A healthy Non-smoker 30-year-old can buy Rs. 1 Cr. cover with a policy tenure of 30 years for an annual premium of around Rs. 8,000, which is the cheapest available option to claim a large cover. Low Claim Rejection Ratio – Generally, claim rejections are very lower if the policy has been active for 10 years or more. The insurer must make complete disclosures about his health, habits, and financials to make sure his family’s policy claim is not rejected in the event of his unfortunate death. Flexibility – Flexibility is one of term plan’s many advantages. You can opt for an online or an offline term plan. Also, for many online policies, the insurance companies do not insist on health check-ups if the cover amount is less than or equal to Rs. 75 lacs. You just have to give a declaration during the application process. Also, user has the flexibility to increase the cover at certain life stages such as marriage, child etc. Moreover, you can customize a term insurance with optional riders without altering the simplicity of the term plan to provide additional protection to your family. 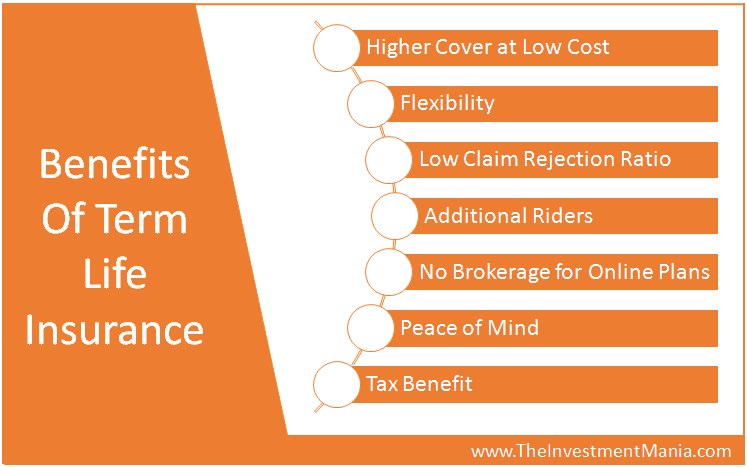 Riders – Term life insurance plans come with a host of riders which provide extra benefits at a nominal cost. Accidental death, permanent or partial disability, critical illnesses, cancer cover, extra life, waiver of premium and income benefits are some of the available options. There is no fixed rule as to who can avail these options, it all depends on one’s needs. For example, if someone works on the shop floor in heavy industries, a waiver of premium or a permanent and partial disability cover can be good for them. However, one should not buy riders just for the sake of it because these riders will increase your premium amount significantly. The rates for various riders vary from company to company and, therefore, one has to read the fine print carefully and watch out for all the exclusions & see if you really in need of such riders. No brokerage for Online Plans – When you buy a normal insurance policy, the commissions charged by brokers or agents could be as high as 25-40 % of the first premium paid. However, if you apply offline for term plans the brokerage element is the least and comes at an average of around 5-6 percent. But if you apply online, the brokerages are zero. This drastically reduces your premium amount, which helps you in long-term. See advantages of online application at the bottom of the page. It brings peace of mind – The feeling of having covered your life with a term insurance can be quite gratifying. You will feel a lot relieved for sure. Your home loans, other liabilities are all under severe threat once the main source of income is gone. A term insurance will take care of all of it. How much debt you have to pay: You must ensure that all of your debts must be paid off in full, including home & car loans, advances, credit card payments etc. If you have a Rs. 5,00,000 car loan and a Rs. 30,00,000 home loan, you need at least Rs. 35,00,000 in your policy to cover your debts (and a little more to take care of the interest as well). Income Replacement: One of the biggest factors for term insurance is for income replacement, which will be a major factor of the size of your policy. If you are the only breadwinner for your dependents and your monthly salary is Rs. 30,000, you will need a policy payout that is large enough to replace your income plus a little extra to guard against inflation. So if you are 30-year-old & want cover for 30 years, therefore calculation of cover will be (Rs. 30,000 X 12 Months X 30 years) = Rs. 1,08,00,000. 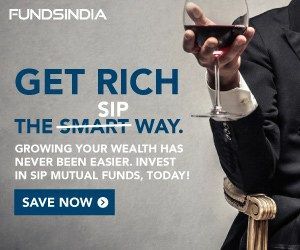 So just to replace your income, you will need a policy of Rs.1.08 Cr. Remember, you have to add this Rs. 1.08 Cr. to whatever your total debts add up to. By considering above points, your debt & income replacement becomes Rs 1.43 Cr., so you must have a policy cover of Rs 1.5 Cr or little above this value. What should be the tenure of Term Life Insurance Plan? At the age of 30, I have another 30 years of work life. If I am not there, my family needs to have an alternative source of income for those 30 years. The need for income replacement reduces as one is near their retirement. If you have bought term life insurance, the family can invest the insurance proceeds received after your death, in various saving options and ensure that they get some regular income to live a healthy lifestyle. Broadly, individuals up to the age of 30 need insurance equivalent to remaining years to retirement times (i.e. 20-30 times their annual income). A person in the 40’s will need protection that is 10-20 times the annual income and person in their 50’s will need cover about 5-10 times the annual income. Note that early you purchase, you are likely to get very low premium. So it is advisable to be insured before 30 years, here your premiums will be lower & also you can take more years of cover. There are many factors to look out when you want to select the best insurer. One of which is Claim Settlement Ratio, It is necessary to select a term life insurer with consistently high claims settlement ratios. Equally necessary is the evaluation of the time taken by the company to settle claims. Also, see the reputation of the firm & their reviews. As age progresses, buying term plan insurance becomes more expensive. Therefore it is advised to continue with my existing policy & if required increase the cover at certain life stages such as Marriage, Childbirth etc. What are my responsibilities while buying term life insurance plan? It is my duty to truthfully disclose all information in the application form. If I do not provide correct and truthful information, the company may decline my claim thereby defeating the objective of purchasing term life insurance. I need to ensure that my latest contact details are updated to enable the company to send reminders and settle benefits in a timely manner. – Determine your desired duration of coverage so that you purchase the correct type of policy and keep your premium payments affordable. Also, check out multiple-quality insurance companies for their rates. – Make sure that your insurance carrier has the financial stability to pay your claim in the event of your death. You can research the financial soundness of your insurer at IRDA website. – Don’t be taken with riders. A very few number of policies ever pay under these riders, so avoid things like the accidental death and waiver of premium riders since they will only raise your premiums. – For 24 hours before your medical exam, keep sugar & caffeine out of your system. It’s best to schedule your appointment early in the morning and don’t consume anything but water for at least eight hours beforehand. – If your premiums are much too high due to medical reasons or you are denied coverage, check if a group plan is available through your company. These group plans require no medical exam or physical. – No health / medical checkup for if your cover is less than Rs. 75 lacs. Most importantly, however, if one were to go for an online term plan, brokerage cost would be nil. So, buy one before opting for any other financial product. Given the uncertainties of life – the not-so-safe roads we travel on or other lifestyle hazards in these days and times – a term plan can save you from a lot of worries by securing the lives of your loved ones. When you purchase life insurance, you’re betting that you’ll live, but also obtaining peace of mind in case you’re wrong. Don’t leave your family unprotected in the sudden event of your death – after all, your family is yours most important assets.